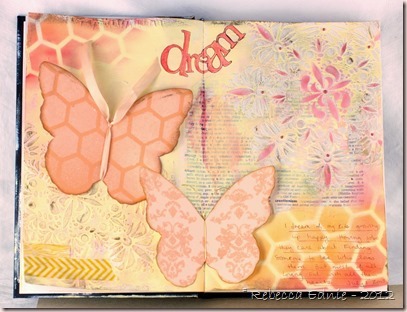 This is for the Shabby Tea Room Challenge this week. I took a basic pail I got from either a dollar store of the Dollar Spot in Target and added some metallic rub-on to the outside. I quickly realized that, even with heat setting, it wasn’t going to set. Bummer. So I added some workable fixatif. Bad idea. It seemed to work but if rubbed to hard, it came off. Then I tried adding some red line tape to attach the lace. The first piece of tape wouldn’t stick at all and removed the rub on and fixativ from the area I was taping and a bit beyond. Seriously? I decided to embrace the uneven nature figuring it lent to the distressed look I was going for. At least the second piece of tape stuck. 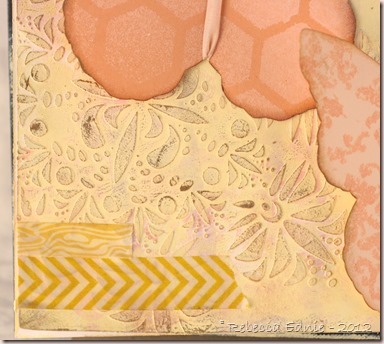 Next I added a Spellbinders fancy label which I stamped and distressed with more rub-on. 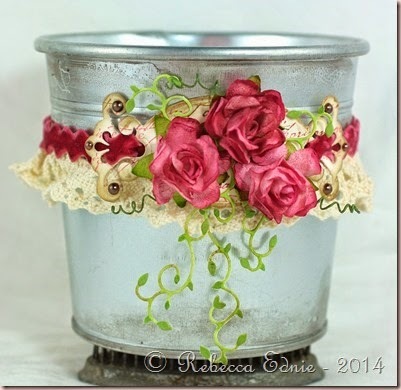 I used ribbon to attach the label and added some pearls. I didn’t have quite the right colour of roses so I added some Copic airbrushing to them. Perfect! These were adhered over top of some mini ivy die cuts. I used Copic markers on white paper to get just the right colour. Click on the photo to link to the challenge. I need more get well cards in my stash and these ones are even better because they can be used for either Get Well or Thinking of You. They are identical except for the middles. They are epoxy stickers I’ve hoarded but have finally decided to use. I popped them up on foam dots so they wouldn’t squish the shaped flower petals. I took them off a hydrangea stem. I coloured the flowers with a Copic marker because I though they were too pale despite being a nice ivory colour. They look really pretty! 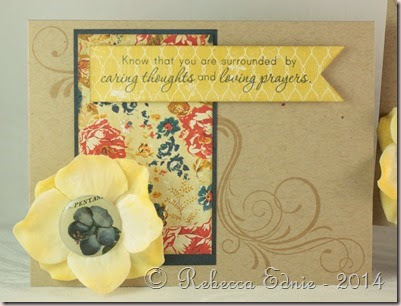 Ink: kraft-PTI, frayed Burlap distress, Navy-SU! Whew! That’s a mouthful huh? This card loses so much in the translation to a screen. I am going to have to take some classes in macro photography because with me saying that with practically every other card, I have got to learn more. I was inspired by the latest Mojo Monday Sketch #327 and C4C217 which had the lovely inspiration photo below. 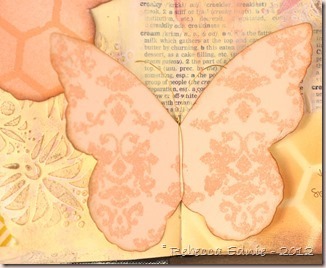 So used the colours (plus I added pink) and celebratory aspect of it for my card. I rarely mix metals but it seems to work with black and white. 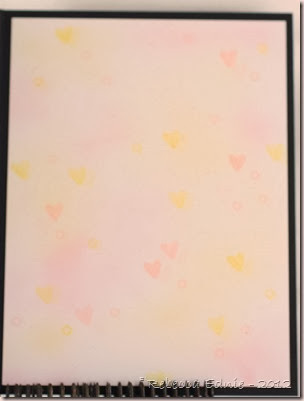 This cardstock is supremely stubborn and refuses to crease nicely despite scoring it properly and using my bone folder repeatedly or you would see my card insert had lovely stamped bokeh on it. I even jammed it into my floral frog to try and get the bokeh ‘confetti’ to show through the vellum. Oh well. My camera wouldn’t focus on it because it was so faint then my camera moved slightly after I focused on a pen I held in front of it then moved it before shooting so it’s hard to see but you get the idea. Turned out so sweet. I found the trick to making it look good was to stamp very randomly and immediately generation stamp right near the first impression usually overlapping. I also added some more full impressions without the second generation and vice versa. I also airbrushed the background both the normal smooth way and with the brush tip to achieve a fine splatter pattern. I added glitter to a brad for one heart, the two top ones were die cut from glitter tape, the ornate white one is a button with the shank cut off and the bottom one was cardstock layered 4 times and stamped with a Damask stamp using Versamark then brushed with Perfect Pearls. 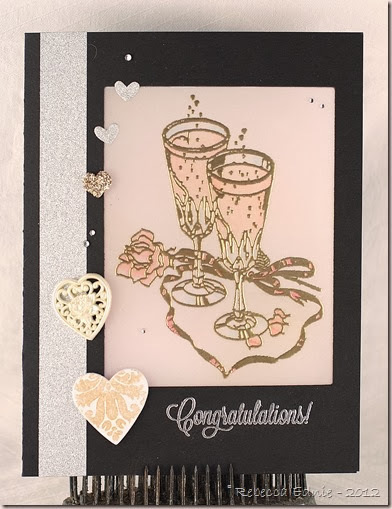 Accessories: brad-stash, rhinestones-TE, button-Jesse James, heart dies-Lg-PTI, Sm-SSS, Perfect Pearls-Ranger, rectangle dies-Nesties, silver and gold embossing powder-SU! 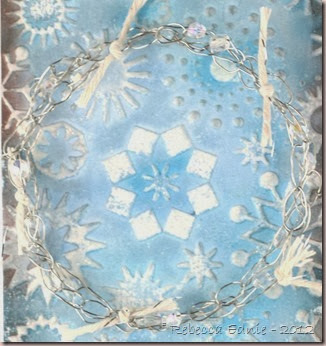 I decided to do a mixed media card this week; this sketch offered so many options that it stumped me for quite a while! 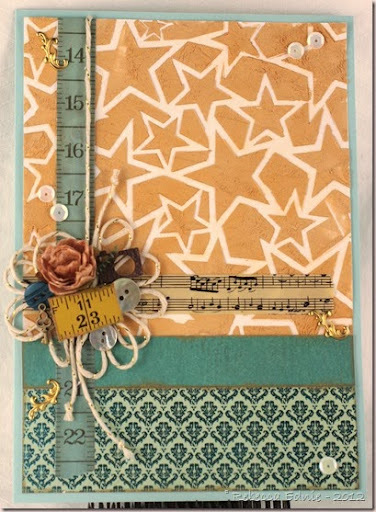 I was working on a mixed media journal swap so I went with a mixed media card too! The stars are shimmerier IRL because I added mica powder called Pearl Ex (like Perfect Pearls without the binder) to my homemade texture paste. Recipe courtesy Gabriella Pollacco. But it’s very fine so comes across as brown in the photo. 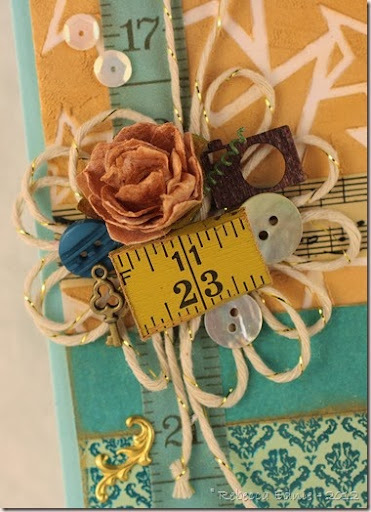 I was going to go with a cleaner more elegant style until I noticed that the music and measuring tapes matches so well but once I added them I realized it was definitely a shabby/vintage look, not a clean/elegant one. 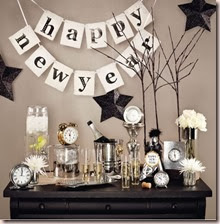 Then I created a dense cluster of embellies all with a fun, eclectic, vintage vibe. Lastly I added the gold swirlies and sequins. 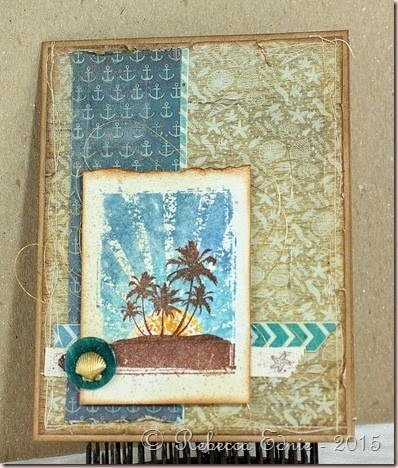 The teal in the bottom paper is foiled so it adds lots of shine! 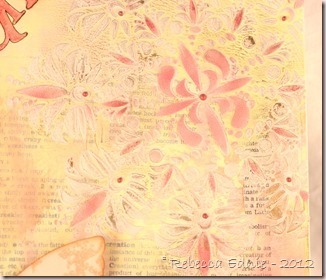 The background paper I added the texture paste too was white but I airbrushed it so it fit better with the vintage style. I ADORE that Copic airbrush system! Over the holidays, we will still be here! So come and play this week’s sketch! Can’t play? 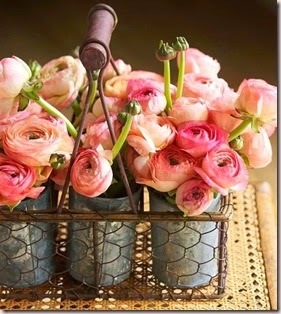 Check out our blogs and leave us some lovin’! Can’t play this week? Maybe next week! Kids or your spouse being home from work or school driving you crazy? 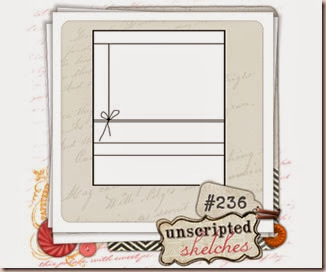 Seek solace in your craft room and join us at UNSCRIPTED SKETCHES!! Have a safe and happy Winter Season with Family and Friends!! for recipe, please email me with specific questions. Wow, Mojo Monday is on their 300th sketch! 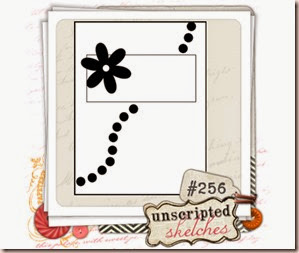 Even though this is a hard week for me to get any crafting done, I had to play this sketch! My original idea wasn’t to use all pink or an awareness ribbon theme but as with most of my cards, it changed as I worked on it and ended up very different than I originally envisioned it. That’s just my process. I really love it though and that’s what matters! The sentiment is light but easier to read IRL. It says ‘There are no small Miracles. 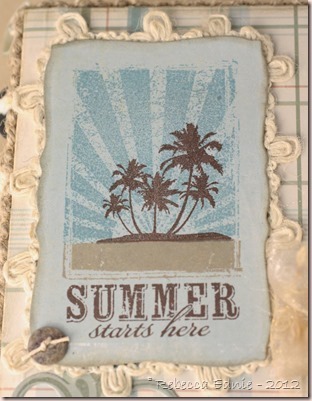 This month’s challenge was Summertime Fun. Since I won a free set from some challenge back in October and I finally chose it (I had been waiting to order some stamps at the same time and get a deal on shipping, never happened… ), I had fun using My Island. 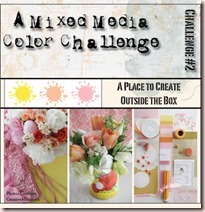 I absolutely ADORE the beach and hot weather so this set and this challenge is so perfect for me! I wanted to do something more than just a card but I hate trying to decide what to do. 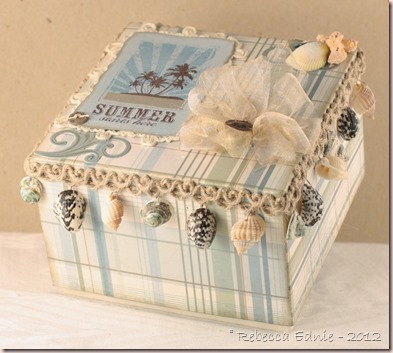 As I looked around my craft room, this little box was just sitting there asking to be decorated! 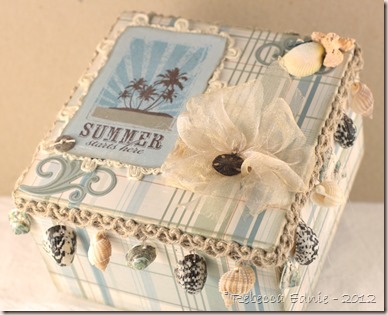 I pulled out some favourite old MME papers which colours remind me of the beach and started covering the box and stamping. 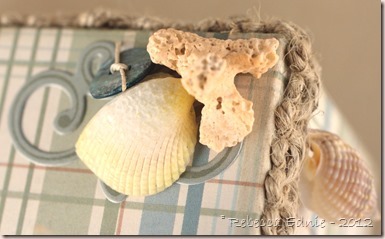 I have a LOT of cool beach related items so choosing which to use was the hardest part! The shell trim has been waiting patiently for just the perfect project. 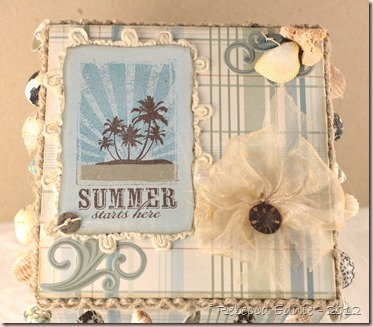 It is too thick for a card and kind of big with the shells spaced too widely. But it looks amazing here dontcha think? 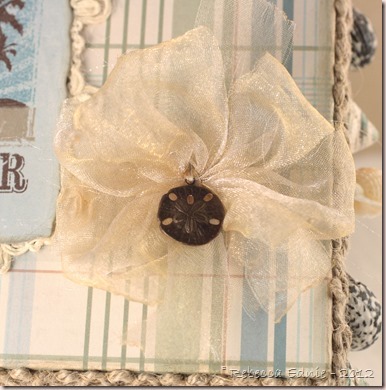 I used some very sheer gold ribbon to make a big bow using my bow easy. Then I distressed it using my heat tool. TIP: To get the bow to fluff up really well, instead of just wrapping the ribbon around and around the tool, pass it through the slit each time. You may need to scrunch your ribbon to make it all fit but that’s ok. 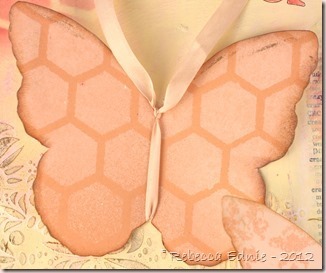 If this means patterned, one-sided ribbon no longer shows the correct side up, just flip it in the middle! Works soooo much better than just wrapping it. The loops always separate correctly my way. I am also entering this in Ribbon Carousel 82 Fun in the Sun. I hope you enjoyed this post and if so, I’d love to hear from you. I treasure each and every comment. Ok, except for those weird spam ones… 🙂 If you’d like to come back, maybe email updates would help? I have a subscription widget on my sidebar. I think my RSS feeder is ending soon and I don’t know how to replace it so if you do, I’d love to know how. Anyway, thanks for reading.